Console LEGO games have been largely entertaining, particularly those involving Star Wars, Harry Potter and The Lord of the Rings. Warner Bros. hoped the magic would rub off on iPhone and iPad with the release of LEGO Legends of Chima: Speedorz, a free-to-play kart racer where players attempt to defeat a variety of opponents in one-on-one contests. Good idea, sub par execution. Compared to most iOS kart racing titles, Chima comes up woefully short. For starters, it only has one cup, with more on the way via downloadable update. This being the case, the Tribal Cup is pathetically easy, and the computer doesn't put up much of a fight until the sixth and final race, where it continuously comes from behind to steal victories. The whole idea is to grab LEGO pieces, as they function as the game's virtual currency; there are no options for in-app purchase. From there, you're able to buy new Speedor hover bikes with superior abilities, just in case you prefer to unceremoniously destroy the competition. As for the racing component, while the game's fun to a degree, the developers made some questionable decisions. There's only one control scheme, which involves pressing left and right arrows to steer while the vehicle auto accelerates; no braking whatsoever. 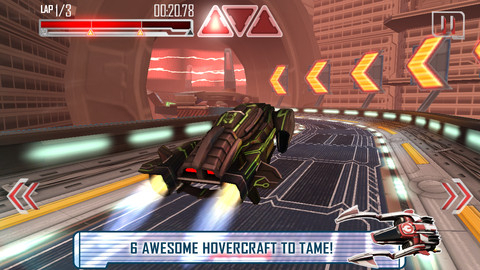 Problem is, the action's somewhat jerky, making it easy to crash into things. At least on the positive side, most objects (rocks, tree roots) break and don't impede your progress too much. Beyond that, you're out to gather as much CHI as possible, as this provides a necessary boost. Instead of swiping anywhere along the screen to activate it, you must pull down on a lever, located on the top right corner of the screen. You'll need to get the timing down, since doing this means removing a finger off the right arrow. Also strange is the fact that you don't see your opponent until the very end of a race. 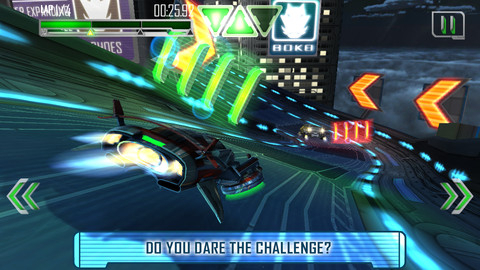 You don't compete on the same track per se, despite the game showing you the other character's position at all times. Instead, you're theoretically on a collision course towards each other, with the loser getting knocked off his Speedor during a brief cut scene that quickly grows monotonous. The same, unfortunately, can be said of the tracks, which lack variety. Subtle changes exist, as you go from forest to desert to swamp, but everything looks the same after a while. What we did like, however, were the brief mini games designed to produce CHI, things like passing through flaming rings or bowling to knock down bricks. When you consider the handful of character blocks you can unlock, Legends of Chima: Speedorz has some value, but there's simply not enough digital meat on this game's bones to hold our collective interest. Instead, it's a reminder that despite LEGO's powerful stranglehold on the toy market, the people who design these games are human after all. What's Hot:Mini-games during races, mixing different LEGO parts to create new characters. What's Not:Only one cup for now, too easy, jerky racing, only one control scheme.